The Pilot Tribune – October 3, 2018 – Read the original story here. In a rare move out of the council chambers, the Storm Lake City Council reconvened at King’s Pointe Monday night for a tour of the city-owned resort. During Monday’s meeting, council members seemed to feel things are headed in a better direction, and expressed few complaints. The resort’s guest ratings through Trip Advisor and other services are rising, and most of their feedback through Google Reviews have been in the four star range out of five of late, Zauner said. Food quality and service had been a point of contention with the council six months ago. Mayor Mike Porsch said he thought the Regatta Grille had improved considerably. Seventeen months into management of the facility, Zauner said that much of the company’s attention has been focused on replacing mechanical equipment and fixing problems left in a sudden split with prior management in 2017, including the public reputation for the resort. The former arcade has been removed, after being plagued by broken-down games. The space has been converted into a party room with a door to the waterpark, that can be rented by guests. The workout room will be retained, but outfitted with new fitness equipment purchased through a local vendor. On the to-do list for the near future is renovation of guest rooms. As the revenue-driver for the resort, attention must be focused there, Zauner said. The improvements will include motion-activated thermostats in guest rooms that have been tested this year and will moderate the heating and cooling when rooms are not occupied. The project will save an estimated $1,000 per room per year in energy use, and state/utility energy conservation incentives will pay for a large percentage of the $28,000 cost. Direct marketing has been aimed at students. “The decision makers are our spouses and children,” Zauner said of travel planning. The resort brought back live music over the summer, and will be adding events like a murder-mystery performance, family movies in the indoor waterpark, and a craft brew festival, seeking to add entertainment options at times of year when there are not a lot of activities in Storm Lake. Ongoing front-desk customer service training has been stressed, along with a new program for tracking and resolving customer complaints. New furnishings have been added in the lobby and conference areas, with the business office and banquet area still to do. A new dehumidification system is being installed in the indoor water park. 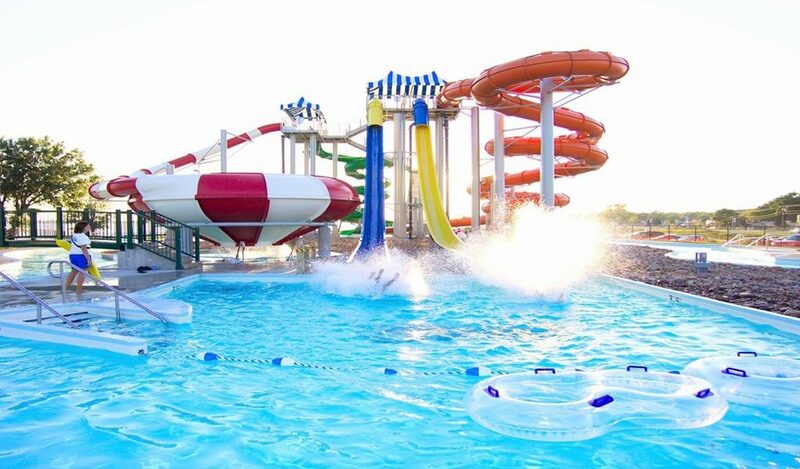 Failed pumps are being replaced in both indoor and outdoor waterparks. With only one pump working in the Lazy River attraction, Zauner said, “It was the laziest river ever. Now it really moves you around.” Only half the pumps in the outdoor park were operating when the company took over. There was not enough money to replace pumps in the Splash Pads inside and outside, so that had to be put off. A “plethora” of repairs has been needed in the kitchen. Designers are due in this week at Regatta Grille to begin planning for a new look for the restaurant. Cottages, also run by the resort, have been renovated, allowing for rates to be increased with no complaints. The Senior Center, in the golf course clubhouse, has received new flooring, paint and hardware. The mini golf course saw its best summer to date, with around 3,000 rounds played in July and August. Golf locker rooms will be renovated. Over $50,000 has been invested in a towel-folder machine. The more automation that can be added, the less human error will be experienced, Zauner said. The patio fire pit had one of three failed burners replaced, with other upgrades for the outdoor area planned for spring. The management noted that major equipment failures can be a big setback for the resort. Each pool pump costs about $8,000 to replace, and a boiler can run $40,000. When mattresses are replaced, 166 have to be bought at a time. “Our greatest concern over 18 months has been what might break… We’re getting things working that needed to work,” Zauner said. In an ideal world, he told the Pilot-Tribune, he would like to see the Storm Lake resort expanded from 100 rooms to 150 – which would allow for larger events and weddings to be hosted. The city currently has no plans for expansion. Council member Rice pushed for renovation of the space under the lighthouse into a location the public can rent for special events, which he feels would take some pressure off the Chautauqua Park shelter. “We have one of the most beautiful spots in Storm Lake, and it sits empty,” he said. He was in favor of the city finding the money to convert the space, even it costs $50,000. Weigand Omega has also developed a mutually-beneficial working relationship with Buena Vista University, and will be planning a student event there this fall.